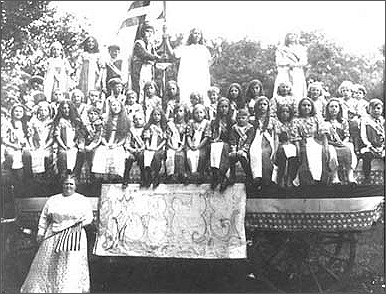 Women’s Christian Temperance Union float on Independence day. The image has been variously dated at 1904 and 1910. Our look at past celebrations continues with Independence Day in 1910. No float that year was as well represented as that of the Woman’s Christian Temperance Union. Each of the children on the float wore a banner with the name of a state on it. The Temperance Union was founded December 22, 1873, in Fredonia, N.Y., out of concern for the damaging effects of alcohol. The organization is the oldest non-sectarian women’s group in the world, and is still in existence today. In front of the wagon is Martha Wood, current Issaquah resident Walt Seil’s grandmother. Two more faces, the girls kneeling in the back row, centered between the two girls standing in white, are recognizable. The one on the left is Josephine Wood, Seil’s mother, and the one on the right is Mabel Miles. From the Digital Collections: Happy 4th of July!